I have always been drawn to details. The geometric designs found in nature. The textures of fabrics & surfaces. The repetition of patterns in everyday life. in terms of the finer details. Noticing the fine details around me and appreciating how they create a larger picture. So many people rush through life without ever seeing the world around them. The fragile ferns and the overlapping shadows they create. The geometric fan of a palm frond. The play of light through colored leaves in autumn. Nature’s designs are all around us if we just take time to notice. All of the subtle beauty that one would miss if they never took time to open their eyes. I try to capture and share a little of that beauty in my work. The fine details. The larger picture. As a child I had always been very tactile. As I worked my way through college and my early career, I searched for an art form that would be fulfilling and speak to me. My experience in graphic design fulfilled my creative needs and attention to details, but not my three-dimensional and tactile needs. It wasn’t until I touched clay that I found my medium of choice. Working in clay is very satisfying and helps bring out my inner child – like making mud pies with a purpose. As my craftsmanship has improved and my personal style became more apparent, I found that I was once again being drawn to my tactile nature and my interest in natural repetition & textural patterns. As my ceramic work progresses, I find that I am working within a dichotomy… control versus random. The controlled craftsmanship needed to make my work and the randomness created in the kiln. I work to make the piece as perfect as I feel necessary; hours of controlled throwing, trimming and stamping to complete a form that pleases me. Then I must relinquish control of that piece when I place it in the kiln. I have found that the process of soda firing my work has forced me to embrace the randomness and appreciate the romance of the firing process. All pieces are handmade and by its very nature a one-of-a-kind masterpiece. 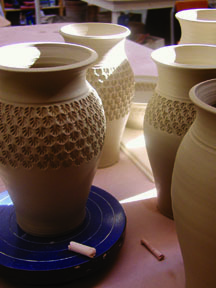 The randomness of the flames caressing each pot creates unique pieces – never to be duplicated. The range of soda flashing is a great contrast to the controlled repetition of my textures. appreciating the subtle nuances and enjoying the world that surrounds us. And if it’s not fun… don’t do it.